At first I thought it was a Photoshop but looking very closely I realized this was the real deal. 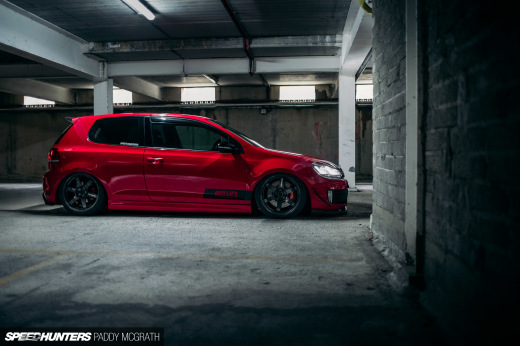 Spotted at the Racer86 blog I was reminded at how good the MK5 Golf could look like. Not sure how comfortable the ride would be, but when you want to look cool you will have to sacrifice. To much Lip/stretch in the rear for my taste!! It looks like a fat pig, no thanks! 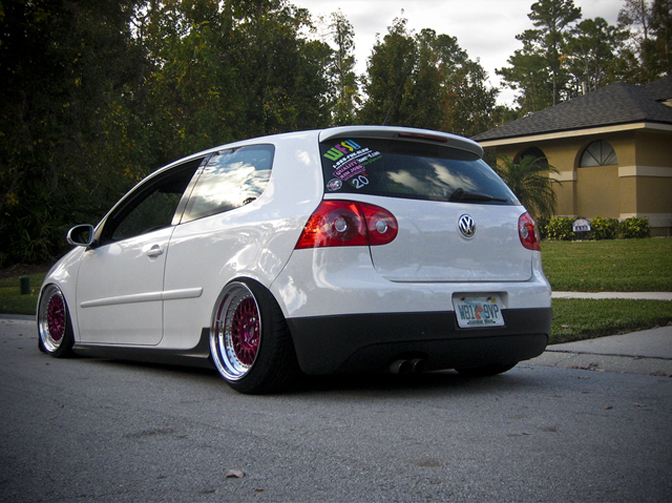 VW guys do things right... and they are never afraid to step outside the box. 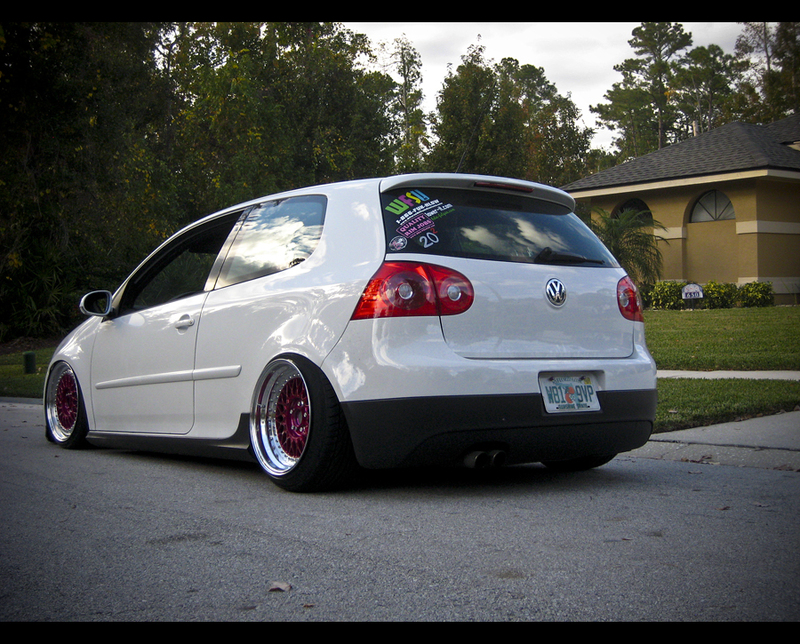 Looks good for a MkV. Still prefer the MkIIIs, much lighter. The Mk6 looks much better though. by the way i love it. 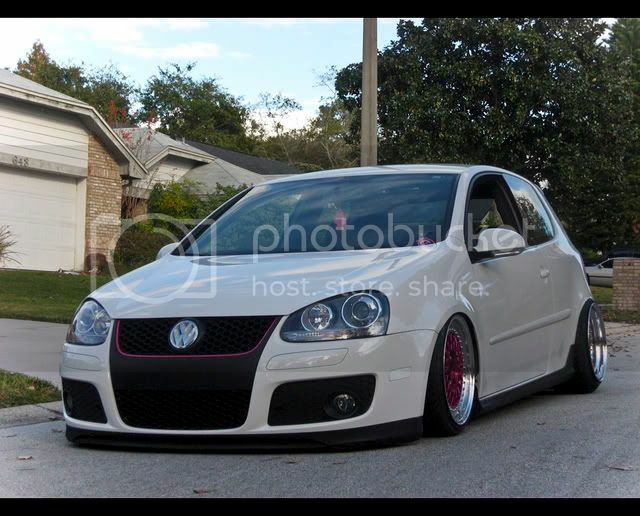 Oh, look, someone did everything completely wrong on a mk5 again. What a shocking surprise! 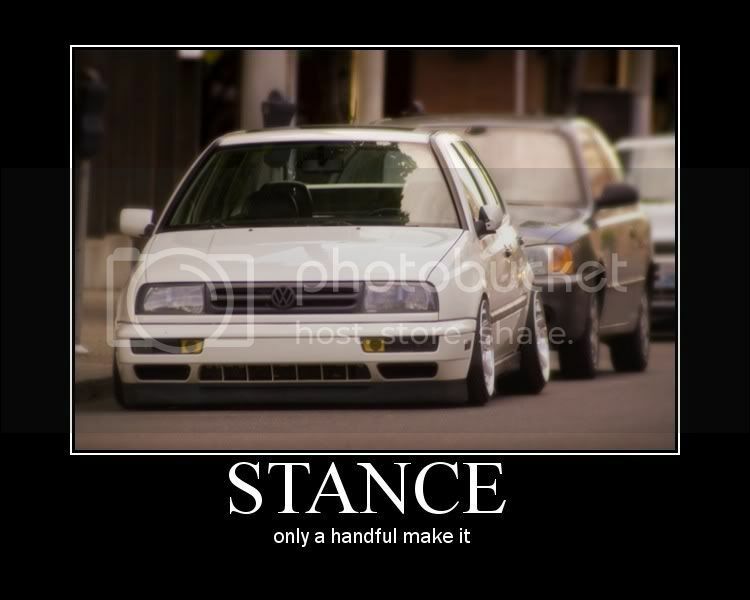 Mk3s are heavy horrible pigs too, don't try and fool yourself. seriously, it looks nice. but then again, different people and different tastes. It is different... but not in a good way. 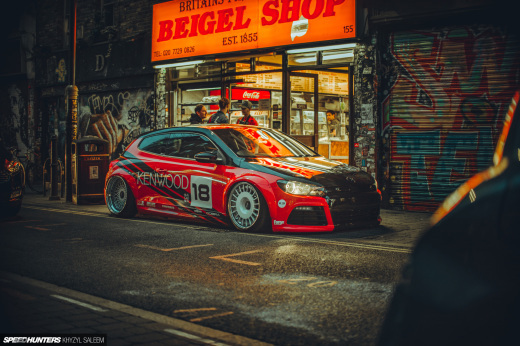 this community obviously being focused on japanese cars first and foremost, i am certainly not surprised at the way this has been received, nor the comments posed about the car's style. To Garrett: staggered wheels on dubs is a somewhat recent thing, maybe the past five or six years. I also dislike it, but my guess is it probably comes from some of the earlier examples of such attempts at getting awesome and rare wheels on a car. 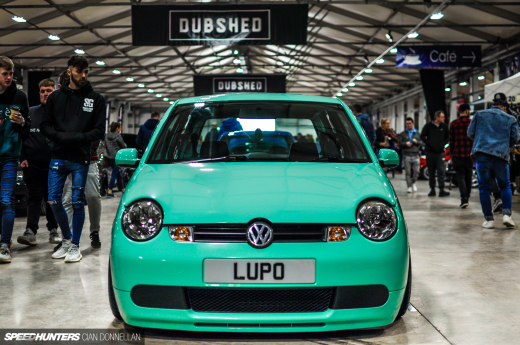 this is something that is HUGE in the VW scene, having the [rarest/deepest/most colour-matched/whatever] wheels. That said, i bet the first couple of guys who tried to rock DEEEEP BBS RS's probably got them off of something that was rear-wheel-drive (rwd cars often have staggered offsets) and someone else saw it and said "hey i want that look too" and it went from there. of course i'm only speculating. if you're going to get antsy about it though, one could wax philosophical and say "why have five spokes instead of six which is the right number?"... do you know what i'm trying to say? i hope i've been able to explain the idea properly. Hell, maybe he just wanted to be able to both tuck and poke on the same car, because he is. The muscle-car rake, coming from my last point, probably has a lot to do with the offsets, and the VW-guy desire of being as absolutely low as you possibly can be. it is considered most honourable to achieve this WITHOUT the use of air suspension, and to roll around at that height all day long. yeah it's silly and pointless but hey we're talking about car modifications let's not get too serious. so, back to my point, my bet is that he dumped it as hard as he could on those wheels. 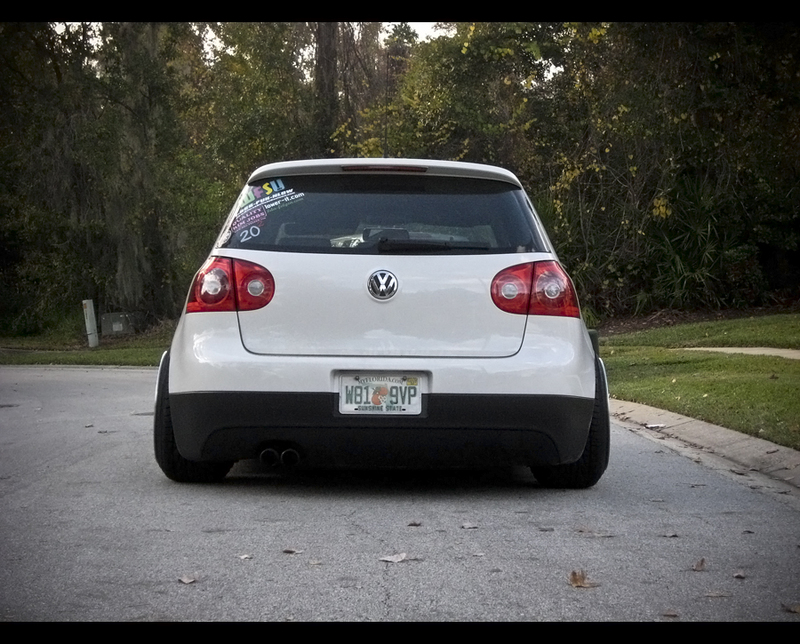 the rears are too wide to tuck, so they just rest on the tire, but the fronts do, so it goes lower. end result: pretty much as low as it gets on a mk5, and it just happens to look to some like muscle-car rake. To INTERNETRACECAR: you seem to be suggesting that there's a single absolute truth on how to do things on a mk5. if there's a "completely wrong" way then it suggests that there is one that is at least as "right". diff'rent strokes for diff'rent folks, what you think looks good, i can pretty much guarantee is ugly and revolting to at least one other person. could it hurt to provide the courtesy of an open mind? Now then, my opinion on this thing. I think it has a nice stance, and i love super-deep multi-piece mesh rims because the father church has taught me to. 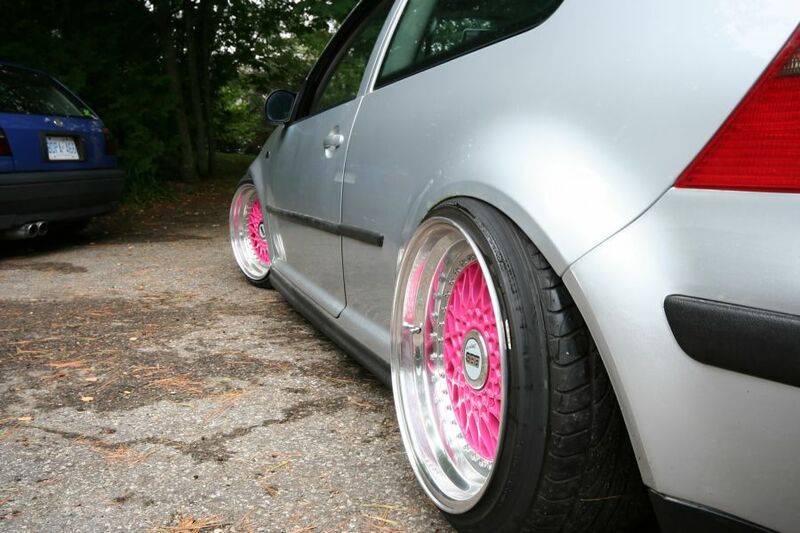 the pink wheels fad is getting a bit much lately though... now you're seeing in the vw scene wheels that are pink, turquoise, basically think of a pastel colour and it's probably being rocked by someone in a vw on their wheels this year. I remember when polo shirts in these colours were briefly in style here in ontario, and it definitely didn't last much more than a year or two. i'm hoping the same happens with this wheel colour style. some people try to follow the trends and do burberry everything (so wheels incl), some people try to get wheels that nobody has ever heard of, etc.... i dunno i think this car looks pretty good with the OEM+ style, except for the wheel colour choice. personally i'd pick something darker like a navy blue or forest green, something that wouldn't stick out like a sore thumb. understatement is the name of the game for a certain few vw guys, including myself. Blueslug- What a waste of time you spent on explaining what is clearly a photo shop pic Are all of you guys blind?? It does look like a photochop, but then again I've seen VWs in person that looked like this so it's hard to know for sure. If it is real, it's gotta be on 'bags, there is no way the rear tires would be able to move without shredding on the wheelwell. I like the front (just right, tucked in). The rear though, it's taken too far. Not only it looks hideous....but with such a stretch tires/ wheel combo....it resemble a RWD car, which it isn't. I've seen a similar approach on few Scion tC.....ugly. jDUB i've been using photoshop for over ten years, and i know just how low dubs can be, this is real. go click on the link Jeroen posted you'll see another shot of it. i'm pretty sure it's on air bags (which is too bad), but i'm 100% sure it's not fake. as you might be able to see on the rear window, since you have such a keen eye, this car is in the WFSU crew, and they have a few threads on the 'tex. My fault It looks so ridiculously stupid I thought it was fake The rear camber threw me off...At that angle it looked fake. WOW! really stupid. Blueslug, You consider this aesthetically pleasent? I dunno know, but to me this is FAR from cool. this car is on air. 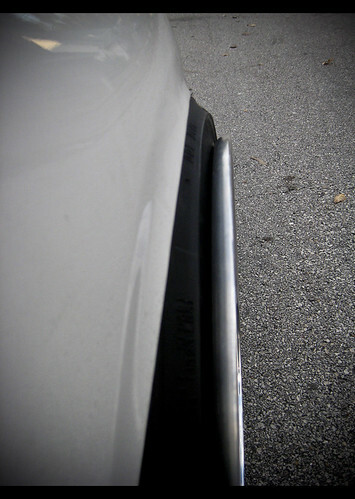 hence the non existant wheel gap.